The symbolism of architecture is undeniable. 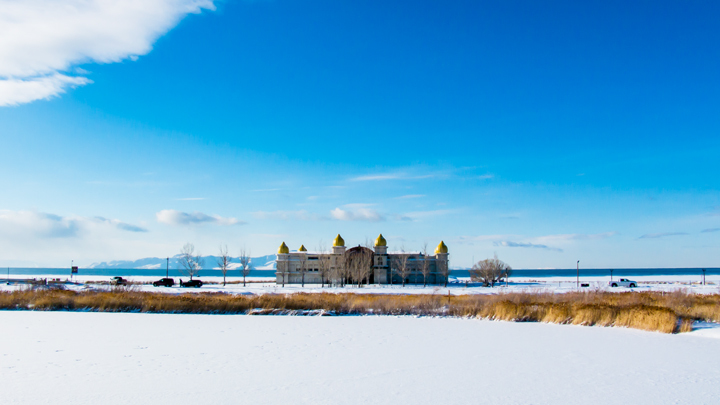 Not many years ago this structure on the shore of Great Salt Lake in Utah was a plain rectangular abandoned concrete hulk, a discarded industrial site. Sometime later it was reclaimed and refurbished as some kind of dance hall/concert venue, an eventual commercial loser just outside the highly religious town of Salt Lake City. Now, with added towers topped by golden cupolas, calling to mind the ethos of religion, the structure seems to be seeing new life. I am reminded of the once popular book Dress for Success by John T. Molloy, whose stated premise was that wardrobe is key to social and business success. No doubt that premise is in some sense still valid today, though language, manners, health, expertise, competence, and character are probably more so. Success values success and seeks to include it in its circle of friends and associates. With that in mind, I've been trying to reconcile the growing discontent we see across the globe that is the apparent motivation for self-immolations, suicide bombings, piracy, poaching, extortions, corruption, and mass shootings. Population scientists tell us the middle class is growing, that class wherein people have enough to eat to stay healthy and an occupation that sustains a life that includes a fair amount of time to pursue pleasure through social and intellectual growth. At the same time, the distance between rich and poor is increasing. And those on the bottom of the pyramid are becoming less willing to acquiesce to a life less fulfilling than they know is possible. It is not a case of not having dreams. It is a case of not having opportunity, knowledge, or means to make any of those dreams come true. However, though many have pointed to it as causation for discontent, poverty is apparently not recipe alone for violence. As reviewed in the Guardian by Jason Burke and by interview with APM's Krista Tippett, anthropologist Scott Atran, in researching his book Talking to the Enemy, has found that, per Jason Burke, "the perception that others with whom one feels a common bond are being humiliated can be a powerful driver for action". In other words, questions like: who am I? where do I belong? and where am I going? are all central to orientation of self and provide framework for understanding of what is happening to one's self. When we are insulted, when our family or friends are insulted, when what we hold as our orienting beliefs are insulted, the desire to strike back, sometimes in violence, is enormous. Atran's finding may only be applicable to immediate reactive violence or delayed violence based on grudges, and not violence based on lack of capacity for empathy or violence for profit, but it does help to explain some of what we have been seeing in the news. Wise people have been saying for generations that respect for each other is key to getting along peaceably. When we are mutually willing to make adjustments to accommodate our differences, we grow as a community. When that willingness is absent, insult, injury, rage, violence, and tragedy can and will result. There is no wall, fence, prayer, cleansing ritual, menacing threat, or preemptive strike that will erase that truth about human nature. May you always be open to including what is different and, in some meaningful useful way, sharing opportunity, knowledge, and means you have so far accumulated. And may your willingness more often than not be met by sincere and substantive reciprocal willingness.